There are a few subtleties. First of all, custom wedding hall should be done at least one month or even one and a half (especially important in the season). And you have to know exactly how many guests to invite, for what amount are going to lay the table, and whether to make further purchases of alcohol. Next business professionals. 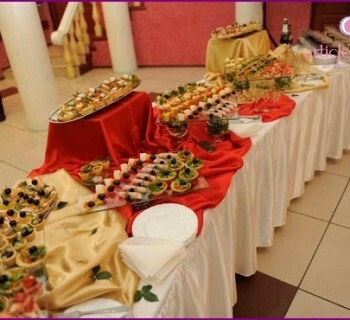 They are prompt, what dishes to order, how to arrange the wedding tables in the hall. Today rent is not paid separately. What you need to consider, so this requirement is a cafe or restaurant to order a certain amount, again based on the number of guests. Menu wedding party, taking into account two mainprinciples: to be beautiful and satisfying (but not too much). That's why usually offer more variety of snacks. And on hot prefer feeding poultry or fish. Time serving dishes stipulate in advance. You can do a general order (it will be easier andeconomical), and it can be batched - in other words, serving food to each guest individually. But our advice is - provide a few innings, revive Table Talk. Before coming Suite guests are servedaperitif - wine or champagne. Alcohol in restaurants is usually sold at a significant premium. Therefore, most often alcohol purchase separately. But it is better to discuss this point with the advance. How much strong drinks? Up to 4 bottles of wine and strong drinks, up to 3 - champagne. For 10 people, you can do about these calculations. Apotheosis of the holiday table - a loaf. Usually, it plays the role of a cake, which is officially introduced into the wedding hall. Usually, when a batch is taken account (again, for 10 guests) up to 2 kg. Banquet time - a separate issue, also requirespreliminary discussion. Typically, dinner starts at 6 - 7 pm and ends at midnight. 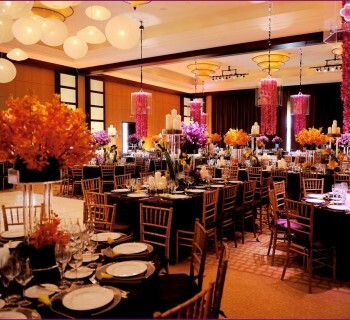 However, to avoid trouble, it is better to provide overtime rent a wedding hall, which is paid by the hour. It is also important number of waiters who willwork for you. Ideal: one waiter for 8 - 10 guests. How much are their services? Usually they include the cost of meals or provide 3-10% of the order value. Do pay them a tip separately - your own business. It is also important to the wedding hall was spacious: place should be enough not only tables, but also to dance and entertainment. Good wardrobe, toilets, smoking - all this is also necessary to consider when searching for a place for a celebration. How to decorate the wedding hall and invite some musicians - you decide. Although you can use the services of a restaurant or cafe. When the amount of the budget will be a celebratory feastclear, make it 15 percent premium, that is, on the safe side. After discussion with the administration of all the subtleties of your chosen wedding halls, make provisional payment. The remaining amount is usually paid either feast day or the day before. How to organize a banquet?